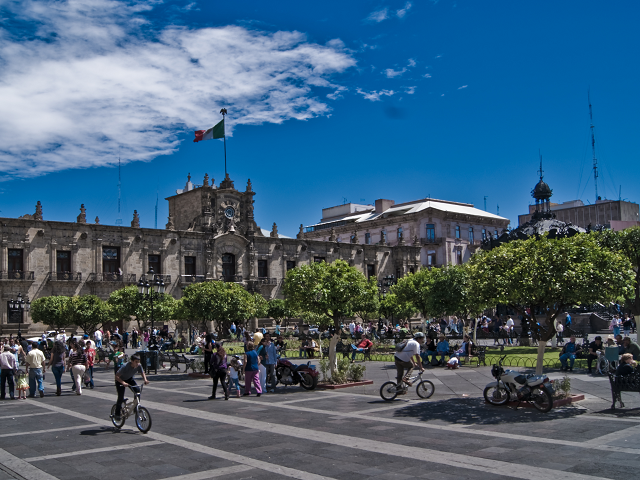 Earth Day 2015 encourages citizens everywhere to lead by example and mobilize for green public spaces—like Plaza de Armas in Guadalajara, Mexico. Photo by Alejandro Castro/Flickr. April 22, 2015 marks the 45th anniversary of Earth Day, an event first held in 1970 that helped mobilize the modern environmental movement in the United States. This year’s Earth Day will include events that focus on the intersection of sustainability, poverty, climate, and clean energy. The message this year is that it’s our turn to lead, so our world leaders can follow us—the citizens—by example. Started in the United States, Earth Day has a long history of making change happen. After the publication of Rachel Carson’s Silent Spring in 1962—which exposed humans’ impact on nature via the pesticide DDT—and the devastating Santa Barbara oil spill of 1969—the public grew increasingly aware of the environmental and health impacts of an unsustainable society. Earth Day founder Gaylord Nelson, then a US Senator from Wisconsin, was inspired by the energy of the student anti-war movement and found an opportunity to push environmental protection into the national political agenda. On April 22, 1970, 20 million Americans protested as part of the Earth Day movement, resulting in the creation of the United States Environmental Protection Agency as well as the Clear Air, Clean Water, and Endangered Species Acts. In 1990, another Earth Day campaign mobilized 200 million people in 141 countries and helped bring environmental issues to the world stage. Since then, Earth Day has continued to grow internationally. In 1990, Earth Day organizing boosted global recycling efforts and helped set the stage for the 1992 United Nations Earth Summit in Rio de Janeiro. In 2000, the focus shifted toward global warming and clean energy. Today, more than one billion people in 192 countries will participate in Earth Day activities. Earth Day’s global presence continues to grow, and this year citizens worldwide are organizing Earth Day activities. For example, Earth Day Network’s India Program, headquartered in Kolkata, is engaging partners to mobilize civic action in the region and build leadership in the environmental movement. Campaigns include Empowering the Women of India (WAGE), which builds a network of female leaders in India to promote women’s role in the green economy, and the Green Environment Monitors (GEMS), which aims to educate youth to be responsible environmental citizens. In Tamil Nadu, India, students in the Madurai District will celebrate Earth Day on April 23-24 this year with the theme of “Clean Earth, Green Earth,” encompassing land, ocean, and atmospheric environmental issues. The event is organized by the Association for Social Solidarity and Empowerment Training Trust (ASSET), a local NGO that works to empower women, educate children, increase environmental awareness, and provide skills training. Near Beijing, China, participants can take a hike, see historic sites, and beautify the Great Wall on Saturday, April 25. The organization Beijing Hikers will lead a group to this world wonder on the west side of Jiankou to clean up trash left by hikers and visitors. Besides being unsightly and unsanitary, litter can harm wildlife and impact our waterways, and must be disposed of properly. Litter cleanups are a direct, effective way to participate in protecting the planet. Finally, México en la Tierra is a photo exhibition that displays ecological changes in Mexico and around the world, and encourages discussion and reflection about the human impact on the environment and ways to take action. The exhibition is open April 18 to June 21, 2015 and is hosted by Antiguo Colegio de San Ildefonso in Mexico City. Urban areas are home to half the world’s population, but generate around 70 percent of global energy-related greenhouse gas emissions. Big businesses can make a big impact by divesting from fossil fuels and investing in clean energy solutions, but there are many ways individuals and smaller organizations can make a positive impact, as well. As an individual or an organization, you can join the Earth Day movement via A Billion Acts of Green, the largest environmental service campaign in the world aimed at building commitments to protect the planet. After reaching the one billion goal in 2012, the momentum continues with sub-campaigns to inspire targeted action, including signing the Climate Petition, supporting environmental education, pledging to reduce energy consumption, and creating art to raise awareness. Scale your impact globally with The Canopy Project, where a tree will be planted for every dollar donated. Along with the environmental benefits of carbon sequestration and soil stability, the trees will help communities sustain themselves with food, energy, and income. Thus far, 1.5 million trees have been planted in 18 countries, including Brazil, Mexico, Haiti, and Uganda. Earth Day reminds us that while the challenges can seem immense, we can all take steps in our communities to make the world a greener place.